Everyone have his/her own perspective when looking at any event or thing. It is the well known fact that different people have different version of the same incident they all are associated with altogether. And, winners always write the history. That’s why only positive sides of the winners are explored more. And wit the passing time the salt and pepper keep added to the documented facts are eventually transformed into legends and myths. 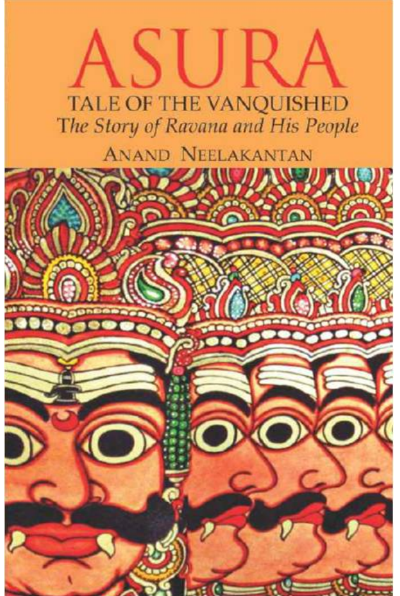 Anand Neelakantan have tried exploring Ramayana from the Ravana’ point of view in his book Asura: Tale of The Vanquished. Ravana was indeed a hero for the Asura clan. He was a brave warrior with immense power. His devotion for Lord Shiva is well known. He was an acclaimed scholar of Vedas and other sacred texts as well. Today also, you can find the people who worship him and respect him. Entire tale is written in a flashback. The situation is, Ravana’s body lied on the battleground unattended. He is already defeated in the great war with Ram (or Lord Rama). While he was waiting for his last breath and parts of his body are being eaten by various creatures, his entire life passes in fast-forward manner from in-front of his eyes. In his early childhood Ravana and his siblings were living at the mercy of his step brother – Kubera. Kubera owned a remarkable amount of wealth (more than anyone living on the earth). And often Ravana and his real siblings have to go to his brother’s door to even satisfy their hunger. Though Kubera often grant the requests, but, Ravana felt humiliated in being treated that way. Living life of a pariah, Ravana ultimately had to run for life and he eventually met Mahabali (also known as Bali). Mahabali was a fallen great king of Asura. He was tricked by Vamana and at the end of a Yagna – he lost almost everything he have. This made him living in an exile. Mahabali sees the potential in Ravana and interviews him. Mahabali found Ravana worth of acquiring the knowledge and warrior skills he possess. After learning a lot of Mahabali however Ravana applied his own logic and was disagree on the philosophy of life from the latter. Here are some of the fantastic words of their conversation of being Dasamukha or Dasanana (The one with ten heads, i.e. ten emotions). Anger is the lowest emotion. It clouds the intellect and can make you do foolish things. You become blind to reason and react only with your body, without thinking. This leads to failure in every sphere. Uproot this evil from your system. Happiness and sadness are just two eternal truths like day and night. A man of superior intellect is never affected by these emotions. They are not base emotions at all but a reflection of our thoughts, a reaction of our perspective on things we see, hear and do. Equanimity is not only desirable in a warrior, but a must. Without it, you are as good as dead in the battlefield. Fear is not an emotion, it is a disease. It spreads from the leader to his followers and vice-versa. Nothing is more condemnable than selfishness. A man who thinks of himself alone is the most unlucy person of all. Love is a chain that ties you to the milestone of make-belief. Take only what life offers you as your own. Aim for things and strive to achieve them, but always keep your feet solidly on the ground. think, think and think, before you act. The only thing worth preserving is your mind. Most humble men are either hypocrites or have much to be humble about. Success breeds pride and vanity. And pride is the only reward of success. Jealousy is the biggest force that motivates humankind. Jealousy is the driving force of progress, envy is the motivating force of life. There is nothing more pure than the love of a mother for her baby. I love because I exist and I exist because I love – I love myself. Intelligence is just a tool to serve our emotions and I want to live as God intended man to live. And, it doesn’t end here, the entire journey is pending for the readers to visit. Let us talk about literary aspects of the book rather than its content. The content may not be liked by everyone. Because most of us are having a pre-defined mindset and beliefs. And we may not welcome the things which challenge our beliefs. There are so many good pieces of writing which are full of philosophical stuffs. Anand have good command on language and he seems have read a lot. The content of the book reflects these things quite evidently. The impacts of the environment in which he might have grown up and lived is reflected in his writing. It require a lot of courage to think against the stream. While we Indians have the great heritage of Q/A in terms of Shrimad Bhagvad Geeta (aka Geeta). And all our scriptures ask us to question everything, until we are not satisfied. The book is good in terms of literary aspects. But, there are a few grammatical mistakes in the book. Also the references like “Egyptian kings are busy building Pyramids” shows the fusion of modern (especially when compared to the time of Ramayan) world and ancient times by the author (knowingly or unknowingly). Also there are some parts of the books which require parental guidance while reading. If you like “Game Of Thrones”, this book have all the scope to become a TV serial like that. We must say that, Anand is successful in provoking thoughts in favor of Ravana. This is his biggest achievement to make readers believe in the content of the book. Much better than some of the commercially successful novels. Overall good book in terms of literary aspects. If you are ok with reading with open mind and are adult enough to digest some brutal stuff, you will like reading it.